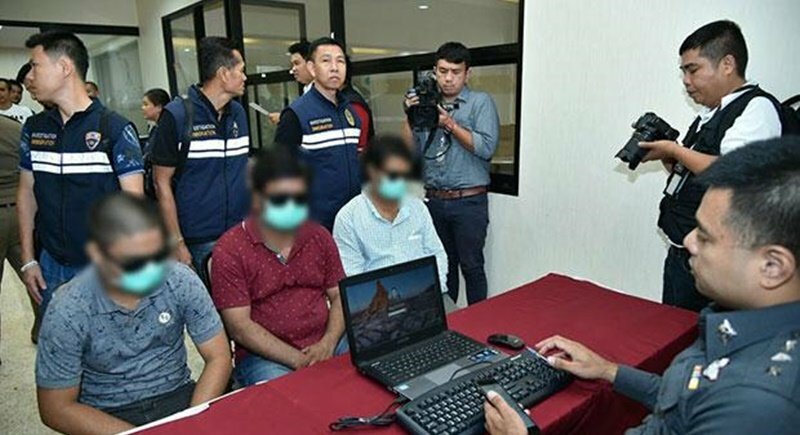 BANGKOK: Eight Indian nationals have been arrested for involvement in a scam that used the names of 300 Thai women in forged marriage licences. None of the women were aware that they were â€˜marriedâ€™. The women are residents of Saraburi’s Wang Muang distrct, deputy Tourist Police Bureau chief Maj Gen Surachet Hakpan said today (May 23) after officers earlier helped 13 victims withdraw their names from the marriage registry. Maj Gen Surachet believes the Indian gang made the fake marriage documents in order to extend their stay in Thailand. Three alleged members of the gang – Prabhakar Singh, Ritesh Kumar and Manjeet Mallah – are facing charges of overstaying their visas while another five – Suraj Prakash Sing, Raju Sharma, Shailesh Kumar TRipathi and Vijendra Nishad – will have their visas revoked due to their alleged involvement in the wrongdoing, according to the Tourist Police Bureau. The latest operation is part of the police’s X-Ray Outlaw Foreigner campaign, aimed at cracking down on foreigners who find illicit ways to stay longer in the country and are sometimes involved in criminal activity. Police have recently targeted international and language schools which issued student visas to foreigners who rarely, if ever, showed up for class. Maj Gen Surachet told the INN News Agency that investigators in the fake marriage scam are checking to see if another 1,700 women in the same district may have “taken husbands” without their knowledge. Two Wang Muang assistant district chiefs and an administration official allegedly used names of 2,000 women to make fake marriage licences in return for B2,000 a name. They have already been dismissed, according to the INN News Agency. If you read the article it states, "Two Wang Muang assistant district chiefs and an administration official...have already been dismissed." and the case was sent to the National Anti-Corruption Commission for a criminal investigation. So, the Indians just bought marriages from corrupt THAI Officials. Who are here the actual marriage gangsters? And only dismissed? Not arrested, convicted, and in prison? How about a X-Ray Outlaw Thai officials campaign? Much of a catch granted. Sorry but this seems to indicate the two Thai "officials" who forged the documents and charged for the "service" are both still employed and not charged with anything only the foreigners have been charged. It would give one a passing thought that perhaps this is not really about justice being served, but just a passing thought of course.